Best Healthcare for your entire family. Same Day Appointments! Walk-ins Welcome. Exceptional, Personalized Care for your family. Customized Healthcare just for you. 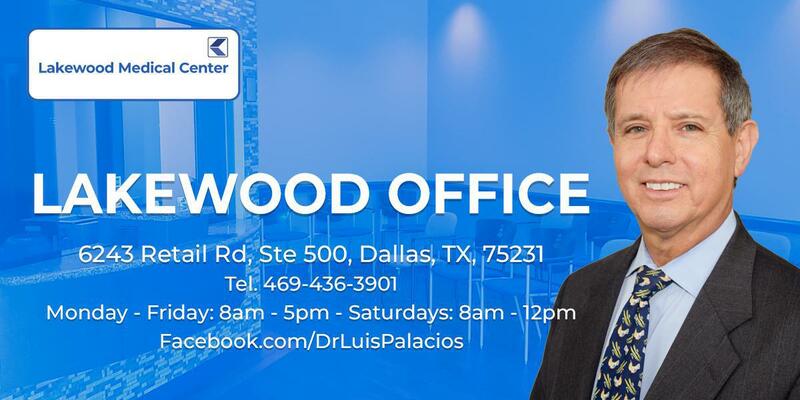 "Dr. Palacios is awesome. I would highly recommend him." "Very thorough with exceptional bedside manner! Such an amazing physician." "Dr. Palacios is an amazing doctor. He has been my physician for about 20 years." "Dr. Palacios is exceptional. He is very wise with tremendous empathy." "Dr. Palacios is the best doctor we have ever been to. We drive over 50 miles to see him." "Very attentive and professional. I would highly recommend him for primary care." Frisco Medical Center is one of Dallas’ leading family medicine practices. Headed by Luis Palacios, MD, the practice offers primary care for men, women, and children in all stages of life. Dr. Palacios provides many services, including wellness exams and management of acute and chronic conditions, such as diabetes and arthritis. And with his background in sports medicine, he is able to diagnose and treat a wide range of musculoskeletal injuries. Dr. Palacios also offers cardiology and dermatology services. Furthermore, he can perform minor surgical procedures at the office, including skin biopsies and joint injections. And if you need care right away, they offer same-day appointments. If specialists are required, Dr. Palacios works closely with expert providers in their network to ensure his patients receive the highest quality care.